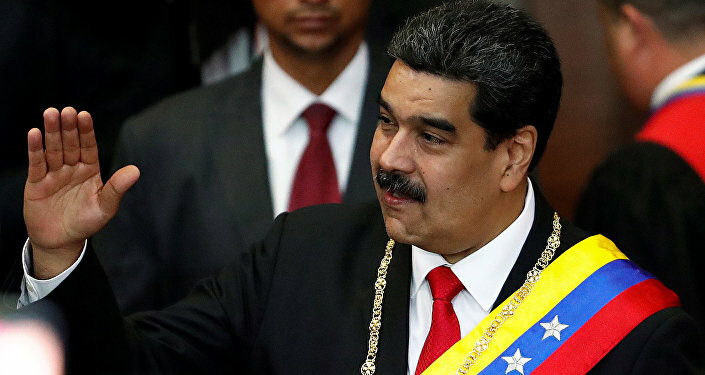 Sputnik has discussed the political crisis in Venezuela, as well as Democrats siding with Trump on the issue with Dr Francisco Dominguez, National Secretary of the Venezuela Solidarity Campaign and also Head of the Latin American Studies Research Group at Middlesex University. Sputnik: The Democratic Party has previously accused Donald Trump of being a grave threat to democracy, however, many leading Democrats are supporting the Trump administration's drive for regime change in Venezuela. Why is that? Dr Francisco Dominguez: The degradation of the US's very imperfect democracy has clearly taken a downturn with Donald Trump. This seems to be one of the (many) manifestations of the severe US decline. It is obvious that despite the rhetoric, the Democratic Party does not seem to have a serious set of policies designed to fully restore democracy. Bernie Sanders has vigorously campaigned that unless Wall Street's interests are somehow prevented from heavily influencing the political process in the US, democracy in the US will continue to degrade. On most international issues the US enjoys bi-partisanship about which there are occasionally tactical but not strategic differences. That is, both parties share the objective to oust the democratically elected Bolivarian government of Venezuela, but they disagree on how. Though on Venezuela, it was Obama who in March 2014 declared Venezuela an "unusual and extraordinary threat to US national security". Such a move was recommended by then US Secretary of State, John Kerry and enthusiastically welcomed by both the Democrats and particularly by the Republicans, especially the extreme right-wing, such as Marco Rubio, Ileana Ros-Lehtinen, Ted Cruz, John Bolton, and such like. Let's not forget that Obama, Kerry and the US government then vigorously supported the six-month-long wave of nasty street violence during the "ousting" opposition campaign whose explicit aim was the violent overthrow of President Maduro. Previously, George W. Bush was strongly suspected of having been behind the brief April 2002 coup d'etat against democratically elected President Hugo Chavez. Your readers can get a full dimension of this coup in the excellent documentary The Revolution Will Not Be Televised. Thus, Trump's policies, including the ongoing US-backed and US-engineered coup d'etat is the logical follow up from Bush and Obama. The current US push for "regime change" in Venezuela is the worst assault yet — short of military aggression — of the US against Bolivarian Venezuela. Sputnik: Many politicians have noted that the US approach to President Maduro could negatively impact Washington's talks with North Korea. How likely is that? Dr Francisco Dominguez: My expertise on North Korea is pretty limited. However what one can observe is that after so many threats by Trump to resort to military force against North Korea we have seen that the two Koreas have decided to seek their own way, internally pushing the US into a position of a pretty much impotent observer. This has been highly beneficial to the two Koreas and the world as a whole. The impact, if any, of Trump's policy on Venezuela, on North Korea will be fully gauged once the outcome of the current US-orchestrated coup against the democratically elected government of Bolivarian Venezuela is known. What is important to stress is the fact that Mike Pompeo, US Secretary of State, forced emergency meetings at both the Organisation of the American States and the UN Security Council aimed at recognising the self-proclaimed "interim president of Venezuela", Juan Guaido, and de-recognising constitutional President Nicolas Maduro. Pompeo was decisively defeated at both. This is the most bizarre and most blatant "regime change" operation the US has ever undertaken. Furthermore, although the European Parliament has a substantial right-wing majority, passed a resolution recommending the recognition of Guaido, the EU Council of Ministers after that could not come to a decision and ended up not recognising Guaido either. People ought to know that China, Russia, Turkey, Greece, South Africa, Mexico, the whole of Africa, the Caribbean nations organised in CARICOM, India and many others, the Non Aligned Movement have refused to recognise Guado, despite the almighty pressure exerted on them by Trump's operatives, Pompeo, Bolton, et all. Thus the central question that the real international community — not the one referred to constantly and falsely by most of the mainstream media — confronts is how reliable are and will be the US when it comes to be faithful to its own commitments, international law and willingness to seek peaceful and diplomatic solutions to crises that may emerge around the world. We have all seen what the US — under Democrats and Republicans — have done to Afghanistan, Iraq, Syria, Libya, and more recently Yemen. This seems to be the "grand plan" Trump, Pompeo, Bolton, Rubio et al have in store for Venezuela. Trump and his "assistants" have threatened Venezuela with military aggression many times already. The world cannot allow this to happen. Sputnik: In your view, why are so many European countries supporting the US stance on the Venezuela issue? What do they have to gain from this? Dr Francisco Dominguez: I would expect the UK to unquestioningly support the US policy on Bolivarian Venezuela. The UK has supported just about every US military adventure in the last decades. Furthermore, the UK government has taken the decision to illegally withhold $1.4 billion dollars in gold held in the Bank of England. So one can see one obvious dimension for the UK government to support the US on Venezuela: robbery. Many people find this outrageous. In the case of the UK, Sir Alan Duncan, the minister in charge of relations with Latin America for the Tory government, prepared the ground for "regime change" some time ago. See details of what he said. Many other European countries face extreme right-wing pressures but also from the US. The norm is that the EU capitulates to US pressure on almost every international issue. They tend not to have an independent foreign policy when it comes to Latin America, the Middle East, Africa, Russia, and so forth; they just follow the US. It is very important to bear in mind that nothing legitimises US foreign policy against some nation, especially if they have the abundance of oil, then the slavish support it tends to get from the European Union. Where the EU does not support the US on some military adventure somewhere, this would substantially or even dramatically isolate the US. If the coup does not succeed, and it doesn't look that it is, and President Maduro stays, as seems the case, what would these countries do when the government of Venezuela seeks foreign investment on oil, gold, coltan, thorium and so on, on which it has huge deposits? Even worse, were the US able to overthrow the government of Venezuela, it is unlikely to offer a share of this potential and lucrative sources of profits to its European partners, which, especially Trump, treats with contempt.